great natural gluten-free protein source, containing all 8 essential amino acids, making it a fantastic alternative to whey protein powder. 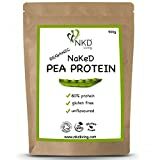 Live NaKeD with our 100% premium organic Pea protein powder. It’s a great natural gluten-free protein source, containing all 8 essential amino acids, making it a fantastic alternative to whey protein powder. Perfect for vegans, athletes and anyone on a weight-loss diet.